Echo Rowing's Lorna Perry was on hand to demonstrate and instruct rowing with Echo Rowing shells at the Maritime Museum on Lake Champlain on Saturday, July 14th. This event was part of the Messing About with Boats Festival of small boats that took place July 14th & 15th. 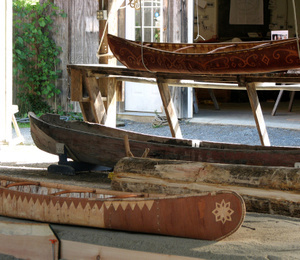 The festival included boat builders and vendors, as a celebration of paddling, rowing, and sailing small boats. There was a Small Watercraft Exhibit all weekend. 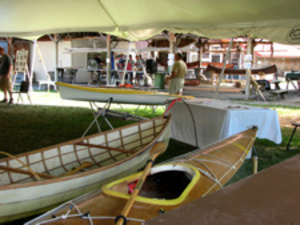 People in attendance were able to meet the boat makers, and try out the boats. For more details, visit the Maritime Museum's website. Lorna brought back some great photos of the boats on display. A typo went out on the Demo Day invite email. The phone number to call to schedule your time to row is 207-438-0212 if you are calling in Maine. If you are outside the state of Maine, please call 1-866-ECHO-ROW (1-866-324-6769). We apologize for the mixup and thank you to everyone who noticed and let us know. Echo Rowing would like to invite you to a Demo Day being held in Northeast Harbor, Maine on August 26 from 9AM till 3PM. Thanks to Morris Yacht, we have been invited to use their launching area. Echo will be bringing several boats and an instructor to help you become better acquainted with an Echo Rowing Shell. This is an opportunity to row an Echo, to ask questions and to meet one of the owners of Echo Rowing. We are asking those interested to email or phone Echo Rowing at 1-866-ECHO-ROW to set up times to test row. We try to give each person an hour to fully experience an Echo.